A day after Joey Logano’s controversial bump-and-run on Martin Truex Jr. coming to the checkered for the win at the First Data 500 at Martinsville, social media still seems to be fired up. Granted, the race’s final 30 laps were some of the best racing we’ve seen all year and the run to the checkered was one of the best this season. But most of the energy from the drivers and peers seems to be centered on Logano and whether what he did was right or wrong. Arguments on whether it was wrong are rooted in the fact that Truex managed to race Logano cleanly up to that point. Meanwhile, the argument that it was right centers around the fact that since a championship is on the line, nothing is sacred coming to the checkered on a short track. Ultimately, that latter train of thought is the more logical approach to the race’s finish. Many argue that Logano raced dirty and that he owed Truex a clean run to the finish. The fact of the matter is that Logano owes nobody anything. Given the circumstance – a win would place him in the championship round at Homestead – giving another driver a nudge in the final two corners of a playoff short track race was what was required to win. Playing nice is out the door at this point of the season. There are no teammates or friends among the playoff drivers, there are only peers. So why are people upset or angry that Logano acted in this manner? Why are people acting like this is unexpected of Logano? He’s bumped Mark Martin out of the way for a win. He’s dumped Matt Kenseth for a win. He’s not afraid to use his bumper. If anything, people are angry because of who made the move – Logano. To most, Logano dons the black hat. He’s not here to make friends; he’s here to win and be the best. That’s literally a requirement in what makes a good racer. He’s drawn the ire of many in the process, and on that note, he ranks up there with some elite company such as Darrell Waltrip and Dale Earnhardt. He’s been popped in the mouth because of this, but he doesn’t back down. Instead, he swings back in some cases, which draws even more ire from his detractors. 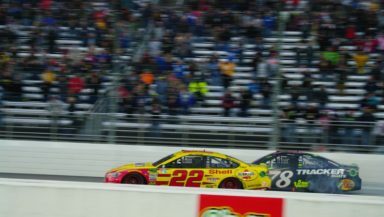 So on Sunday at Martinsville, when Truex made his move too early and cleared Logano off of Turn Two, it should have been obvious Logano was going to bump Truex. It was an innocuous bump, the same Jeff Gordon used on Rusty Wallace at Bristol in 2002. It was a simple bump short track racers across the country use to win. There was nothing wrong with it. So, for the most part, this ire was unwarranted. Two drivers raced hard for the win on a short track which carried some serious championship ramifications. Given the current playoff system – “Win and you’re in” – the bump for the win was cultivated almost perfectly by the system. It’s a moment that has happened before and will happen again as long as this system sticks around. So with that said, it was typical, awesome short track racing. Just a couple of observations. I was at Martinsville Sunday and apparently Truex was the only person there who didn’t see what was coming. While he raced Joey clean leading up to the last lap, the rules change at that point. Also factoring in I believe, was the long simmering hard feelings between Joey and all things Joe Gibbs Racing, of which Truex is an extension. I think Logano is more motivated to beat the Gibbs Toyotas. He’s kinda like the Incredible Hulk except in yellow when he transforms from Joey Logano to Joe Logano, driver on a mission!